Before 2005, most PIP capable Samsung TVs had two built-in tuners. 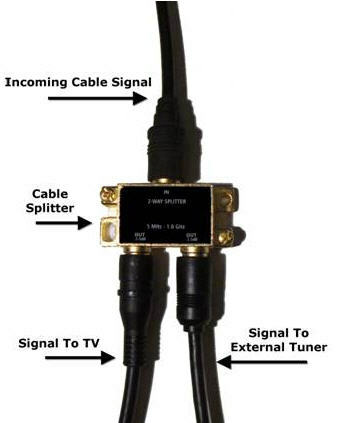 If you connected a cable TV source or antenna to each tuner's input jack, you could watch two channels simultaneously using the TV's two tuners and its PIP function. Since 2005, all Samsung TV's have been equipped with a single tuner. This change changed the meaning of PIP. Because TVs had only a single built-in tuner, you could not use PIP to watch two channels at the same time unless you connected a second, external tuner to your TV such as a cable box or satellite box. After you have the necessary equipment, you can setup your TV for picture in picture. 1 Attach the Coax Splitter to your incoming cable or satellite line. 3 Attach one of the two coax cables to the RF Cable In on your TV and the other to the RF Cable In on your external tuner. 4 Connect your external tuner to the TV using the HDMI, Component, or VGA connections on your external tuner and TV. NOTE: Check the Viewing Picture–in-Picture section of your owner's manual to see how you can connect your external tuner and TV. There will be a chart in that section showing which connections you can use for PIP. For example, the sample chart below shows that, to use PIP, you can connect your external tuner to the Component 1 and 2, HDMI 1 and 3, HDMI/DVI 2, or PC jacks on your TV.